Nation Wide Shelving's Corporate office in Boise Idaho carries most brands and types of Pallet Rack Shelving including Interlake, Mecalux, Frazier, Borroughs, Penco and far to many to list individually. We offer Industrial Storage Products which can save you time and space as well as improve productivity making your day easier. We have what you need! Our business is to weigh your goals, and deliver a system to compliment them. Pallet Rack is available online in our online material handing catalog or you may phone for a representative to visit your location and assist you with your selection and layout. Our highly trained designers will take the measurements of your space, and assure you get the most possible storage. You can be assured the best setup for your needs. There are many types of pallet rack including conventional pallet rack, structural pallet rack, drive in drive thru pallet rack, live pallet rack, mobile pallet rack, teardrop, and push back rack. 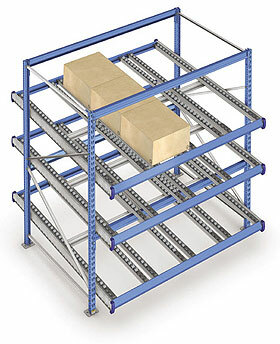 Pallet Rack is designed to provide highly efficient storage of countless parts, inventory, distribution centers, automotive, assembly and storage needs. Even large retailers have found pallet rack a good looking and inexpensive way to display stock for customer purchase. From a few beams to large installations connected to complex automated storage and delivery systems we can help you determine what you need. Our highly trained designers will insure you get the right rack and the most possible storage. From simple to complex solutions for all forms of shelving, including sophisticated multi-level and modular applications. Interlake Pallet Rack, Frazier, Bulldog Rack, Durham,Nashville Wire, Jaken, Mecalux, Ohio Rack, Rid-u-Rack, Steelking, Tier-Rack, Artco (Tube) Pallet Rack,Buckley Pallet Rack, Burtman, Structural Pallet Rack, 'Altrui Pallet Rack, Dexion Pallet Rack, EMI Pallet Rack, Frick Gallagher Pallet Rack, Husky Crashguard Pallet Rack, Inca Pallet Rack, Lok-Rack Pallet Rack, Palmer Schile Pallet Rack, Sammons/Bloom Pallet Rack, Unarco II Pallet Rack, Keystone Style Pallet Rack, T-Bolt (Unarco) Pallet Rack, Speedrack Pallet Rack, Paltier Pallet Rack, Structural Pallet Rack, Sturdi-Bilt Pallet Rack, Ridg-U-Rack Pallet Rack, Webb/Slide-N-Lock, Hiline Pallet Rack, T-Bolt, Hiline, Unarco II, Paltier, Palmer, Shile, Husky, Prest, Slide & Lock, Frick Gallagher Amrack, Mirak, Penco Pallet Rack and other products make one full line! need a brand you don't see listed please phone in to see if we carry it. 208-284-2559.